Astronaut and member-elect of the United States House of Representatives Jack Swigert has signed this 8 x 10-inch photograph. Swigert, a member of the Apollo 13 mission, spent just under six days in space and was awarded both the Presidential Medal of Freedom and the NASA Distinguished Service Medal. In 1982, Swigert was elected to the US House of Representatives, however he passed away before taking office. 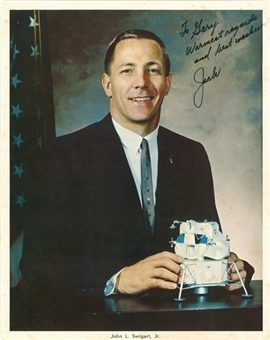 Swigert has signed this offered photograph as simply “Jack” in black marker. He inscribed “To Gary / Warmest regards and best wishes”. This photograph has been pre-certified by Beckett Authentication Services.